Even though the commercials have already revealed the biggest plot twist in "The Negotiator" (with a clip that isn't even in the movie, no less), it's not enough to spoil the intensity, intelligence and electricity of this high-anxiety hostage drama in the "Die Hard" vein. Samuel L. Jackson stars as Danny Roman, a master Chicago police arbitrator framed for pension fund embezzlement. A stand-up guy and an honest cop, he discovers someone in Internal Affairs is part of the cover-up and in desperation take control of the I.A. office at gun point, insisting he'll kill hostages if the real culprits don't come forward. One of cinema's smoothest, toughest and most charismatic actors, Jackson has the audience rapt from the opening scene, before the frame-up, in which he talks a suicidal divorcé down from killing his daughter. It's all in his burning eyes and furious, melodious voice that reads great fervor into every line he speaks. The man acts from the inside -- deep inside -- out. But after his partner is killed (ain't it always the way?) and Roman is framed his murder, on top of the embezzlement, he takes captives on the 21st floor of police headquarters, trying to set the record straight by force. "There are some bad cops among us," he says over the police radio, addressing his comrades who have gathered outside the building to do their jobs and stop him, "and today we're gonna learn who they are." Because he's used to being on the other side of this set up, he knows how to shut down the cops down -- shuttering windows to block snipers' views, shorting out elevators to prevent an easy approach and blocking air vents so miniature cameras can't keep tabs on him. As the police pool their resources, inside Jackson butts head with an Internal Affairs director and known conspirator played by J.T. Walsh ("Breakdown," "A Few Good Men") in his last role before his death early this year by heart attack. A great character actor who had perfected an creepy, untrustworthy glare, he verbally spars with Jackson as they try to beady-eye each other into submission. 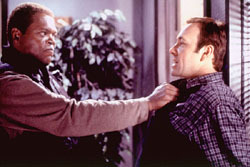 During this scene I wrote in my notes "you can't get much more intense than Sam Jackson and J.T. Walsh staring each other down." But then I remembered co-star Kevin Spacey was yet to appear and realized the interplay had barely begun to get interesting. Spacey, one of the few actors in Hollywood capable of as much impetus as Jackson, plays Chris Sabian, an maverick negotiator from another precinct brought in on Roman's demand because he doesn't know who to trust in his own division. With these two brilliant actors pitted against each other, "The Negotiator" ups the ante for intelligent action movies. With page after page of provocative dialogue and smart twists, accented with Jackson's spinning wheels and Spacey's piercing calm, the story instantly becomes a sly, extreme chess game with guns and hostages -- the kind of action movie Hitchcock might have made. And soon Sabian begins to wonder if he might be on the wrong side of this conflict. Director F. Gary Gray ("Friday," "Set It Off") handles his first major feature like a veteran. In exploring the art of negotiation, he taps his actors for every ounce of concentration and controlled fear, and gives the movie mood and style through the overtly cinematic camera work of Russell Carpenter ("Titanic"). He also provides us with a supporiting cast of smart (and occasionally smart-mouthed) hostages and focuses some screen time on the strife within the police ranks, as many officers believe Roman and are reluctant to take him out. However, bevy of trigger-happy cops are provided as well, to keep the audience and the characters guessing and second-guessing who might be framing our hero. If you want to pick nits, "The Negotiator" has its share of loopholes to exploit: What's the motive for framing Roman as opposed to any other cop? The audience realizes he won't really shoot anybody, so why do his fellow cops -- and friends -- think he would? Why does Roman's under-written wife disappear just when using her would have made the negotiations that much more interesting? But this movie bottles inventive action better than any "Batman" or "Lethal Weapon" and spikes it with tension and emotion. Last year Eddie Murphy played a hostage negotiator in "Metro" as nothing more than a gimmick for car chases and explosions. The writers of this picture (James DeMonaco and Kevin Fox) must have seen that movie and had the same reaction I did: Why have a character be a hostage negotiator if you're not going to exploit his expertise? They did something about it -- they made the best action movie of the year with far more brains than brawn.